Olymp Trade is a fairly young brokerage company that registered its activities in 2013 in Cyprus. The official site of Olimp Trade began its work in September 2014, being jointly owned by Frandom Holding and Smartex International Ltd. Representing their interests from one legal entity. The brokerage firm Olimp Trade is certified by the company CROFR. The organization is aimed at the Russian audience, so the official website of the trading platform Olymp Trade supports all important information in Russian.Over the past year, the quality of the trading platform and the services provided by the broker have improved significantly, which has significantly affected the influx of new traders into this company.Strengthening the position of the leader in the markets of Russia and the CIS, Olymp Trade began to expand actively in the international arena. Currently, the broker is represented in more than twenty countries and provides trading products in ten languages.The trade turnover of Olymp Trade for September 2017 amounted to more than $ 96 million. The appearance of the main page site is quite simple and first of all it offers the user to register. Also, site navigation is built in such a way that the user does not confuse the amount of information and at the same time, so that the user can easily find what he needs. Register on the trading platform can be any user, regardless of experience in trading. Registration on the trading platform Olymp Trade is simplified to the minimum and you just need to enter your name and come up with a password.Also, when registering an account, a trader can choose a convenient deposit currency. You are given a choice of the ruble, the dollar and the euro. Note that the selected currency can not be changed later.Of course, in order to use the full functionality of the broker, in the future you will need to provide more complete information about yourself - contact details, date of birth, methods of withdrawal.But for the start of trading and, the more so for using a demo account, it will be enough to simply register a few clicks.It is important to indicate your real data when registering. 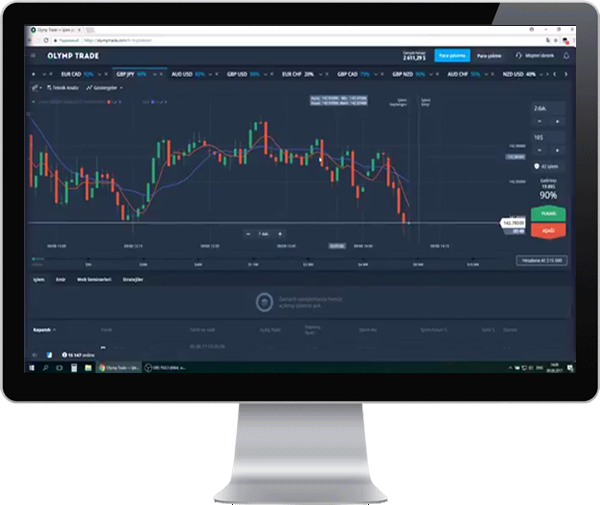 If, if you specify incorrect data, there may be problems with the withdrawal of funds later.After a quick registration of the account, the customer enters the trading platform of the broker Olymp Trade, where he can get acquainted with a brief interactive instruction on the operation of the platform and the basic principles of concluding transactions. Demo account in Olymp Trade is available in your account immediately after registration (no deposit).A demo account with 10,000 virtual units will be especially useful for beginners. It can be trained before real operations. Trade in a demo-currency functionally does not differ from transactions for real money. If you spend more than half of the virtual units, you can get another 10,000 for free.When replenishing the account, the demo cabinet does not disappear, so that along with real trading, you can test new ways of trading on the demo. Depending on the amount of replenishment, the broker provides an opportunity to receive a bonus. In this case, the broker does not make rigid restrictions with regard to the withdrawal of bonus money - for this it is only necessary to make 25 times the amount of working capital involved in the contracts. Before accepting this broker's offer, it is necessary to carefully study the conditions for granting the bonus. In addition to regular bonuses when replenishing, another nice bonus is provided for new traders - if you replenish the account within an hour after registration, you will receive a bonus of 100% of the deposit you deposited; your deposit is doubled. All that is needed to be provided is to register. It has 10 thousand virtual units, which can be replenished if necessary. • Yield to 80% of the investment amount;• The maximum cost to 150 000 rubles;• Withdrawal of funds - from 1 to 5 working days;3. VIP account:VIP-service on Olymp Trade opens a number of advantages for the trader that are not available to other users. In order to get VIP status, you need to make a deposit of $ 2000 (€ 2000 or 100,000 rubles). All the advantages of the VIP account come into effect immediately after assigning the corresponding status to the account. It is worth noting that when you withdraw part or all of the deposit amount within the first 15 days, VIP status can be deactivated. • Photo or color scan of your passport.• Photo or scan of another document proving the identity. This can be a foreign passport, driver's license, SNILS, TIN or utility bill.• You may also need (sometimes staff ask to confirm the address) a scan of the document confirming the address of your residence, for example, an invoice for payment of the Internet or telephone.• If you plan to replenish the account and withdraw money using a bank card, you will need to send a photograph of the card with a sealed number and CVV. 1. The broker provides the opportunity to trade only classic binary options "Above / Lower", while also very limited expiration of contracts - up to three hours. 2. Also, the broker Olymp Trade is notable for the fact that working with it, you can trade not only in standard working days, but also in OTC mode on weekends. But at once we will notice, that in such days trade is interfaced to the big risks, since. price movement in this period can be determined solely by the broker's schedule, but for carrying out a deeper analysis of the possibilities there is practically no. 3. One of the terms of trade is the ban on the use of robots. If this condition is violated, the account may be blocked and the results of transactions canceled. 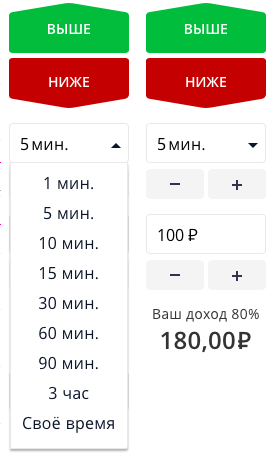 The amount of the minimum option Olymp Trade The minimum bet in the brokerage company Olymp Trade is 30 rubles or 1 $. 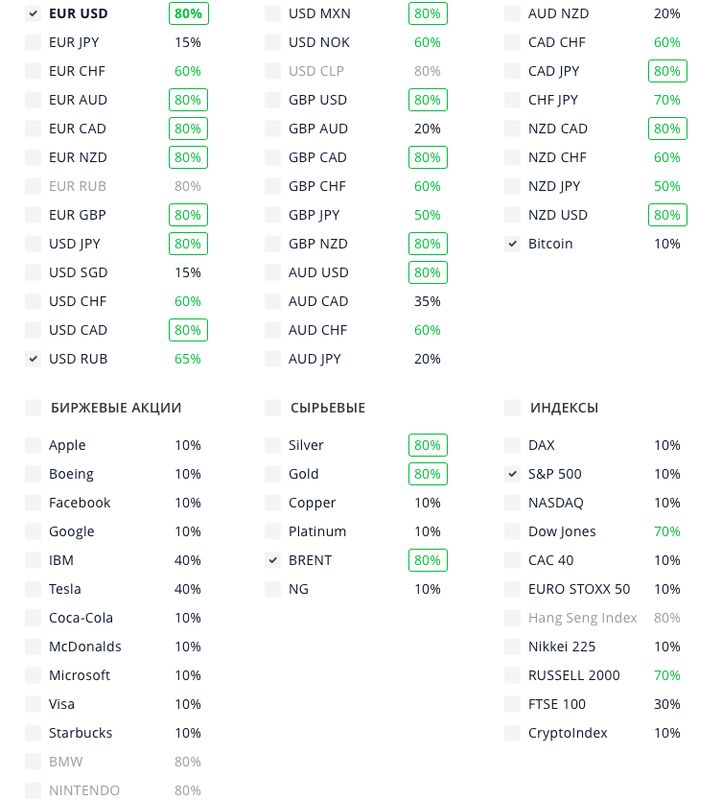 The income from any option is up to 90% of the amount in the flesh.All this, makes it possible to minimize the occurrence of risks, if you want to operate with a small capital for the gradual accumulation of trade balance.Because of the amount of the minimum bet, the trading platform is considered to be an ideal option to test your strength in the field of binary trading, both for beginners and experienced traders. Russian, English, Thai, Indonesian, Portuguese, Turkish, Spanish. 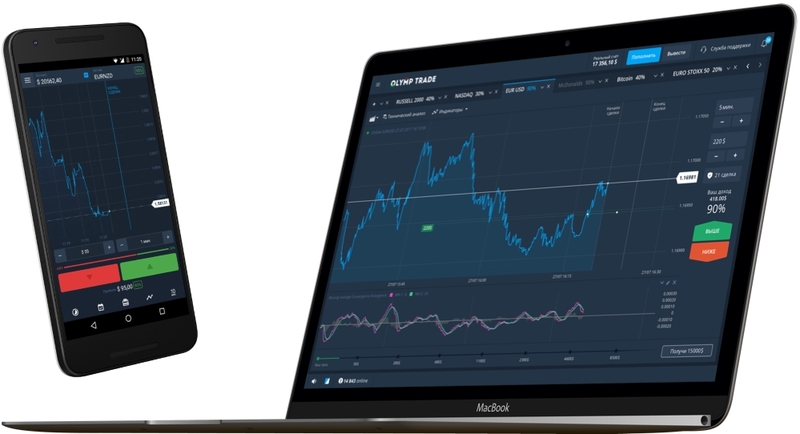 On the trading platform Olymp Trade, more than 60 assets are available for trading, including 35 currency pairs, 13 shares of various companies, 6 commodity assets and 11 indices. 1. Olymp Trade provides such a tool as "Cancellation of the transaction. "If an error was made in the analysis and, as a result, the price of the asset went to the opposite from the forecasted side, that is, the opportunity to cancel the deal. At the same time, up to 60% of the amount will be returned. You can do this in the first 5/6 of the option expiration time. Suppose you started a deal lasting 60 minutes. In the first 50 minutes, cancellation is allowed. 2. A tool called "Delayed Deal". It is an application for the sale or purchase of an option at a specific time or at a specified asset price.Suppose, with 100% certainty, you know that in the evening news there will be a message that will lead to an increase in the value of "black gold". You would be happy to start a deal, but you will not have access to the Internet. An excellent way out in this situation is this tool. It's simple: you create an application, specify a specific time and go on business. For absolute comfort and pleasant trading, the broker Olymp Trade provided its clients with an excellent set of ways of input / output of funds. 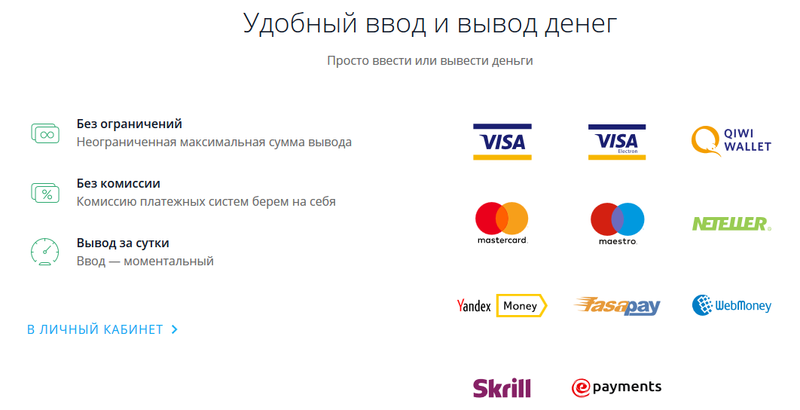 Among them - VISA, QIWI, Master Card, Neteller, Webmoney, Yandex-Money.The timing of the withdrawal of funds is also pleasantly impressive - from 1 to 3 working days, and for VIP accounts the withdrawal takes no more than one day.In order to withdraw funds from the account, the client must draw up an application from the personal cabinet using one of the suggested methods. All withdrawal of funds is processed in the order of the queue.Separately it is worth mentioning the opportunity appeared in 2017 to replenish the account and withdraw funds directly to crypto-purses bitkoyn. The funds are deducted to the same payment method from which the account was replenished. Replenishment with the help of electronic money is carried out instantly, but when replenishing from cards, there may be a delay of up to 3 working days. But this is not the fault of the broker, but of the banks.We should dwell on one important point. You can withdraw money only to the account from which the replenishment was made. This is one of the guarantees of a high level of security for all payments. 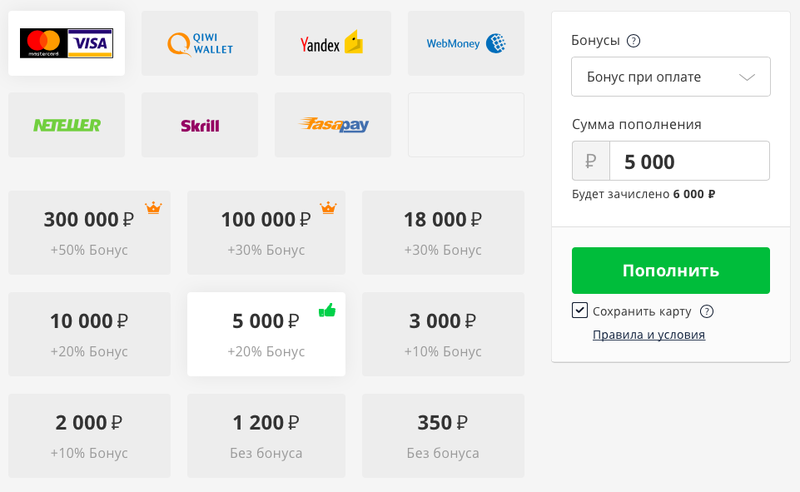 To enter funds, go to your personal account and choose the appropriate method of payment: Yandex Money, VISA, Qiwi, Neteller, MasterCard, Contact 24. Then the amount of the deposit is indicated, after which you need to follow the instructions. The minimum for replenishment in Olymp Trade is 350 rubles / 10 usd / 10 eur, and the maximum for input is 350 thousand rubles / 10 thousand usd / 10 thousand eur. In concluding my review of Olymp Trade I propose to objectively weigh all the pros and cons of trading with this broker. • Olimp Trade is a fairly large by the Russian standards broker of binary options. With the departure of IQoption from Russia and after the introduction of a new, better trading platform, Olymp Trade received a huge influx of traders.• Presence of a regulatory body: the company is under the regulation of the International Financial Commission, which oversees the activities of the broker and provides deposit insurance for the clients of Olymp Trade;• Absence of commission for withdrawal / input of funds• Minimum requirements for entering the market (deposits of only 5 $ or 350 rubles);• Minimum requirements for trading (transactions from only $ 1 or 30 rubles);• Demo account;• Bonuses, promotions and tournaments;• Convenient mobile application: Olymp available for Android and iOS allows you to easily remain "in the market" anywhere in the world;• Own trading platform with innovative parameters;• Work safety is guaranteed by SSL protocols, CROFR regulation and the storage of traders' funds in a reliable European bank;• Analytical services (technical analysis, news of the markets). 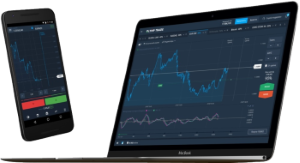 The trading terminal of the brokerage company "Olimp trade" is not limited to the PC version: everyone can download the mobile application "Olymp Trade" free of charge and trade binary options on both Andoid and ios. 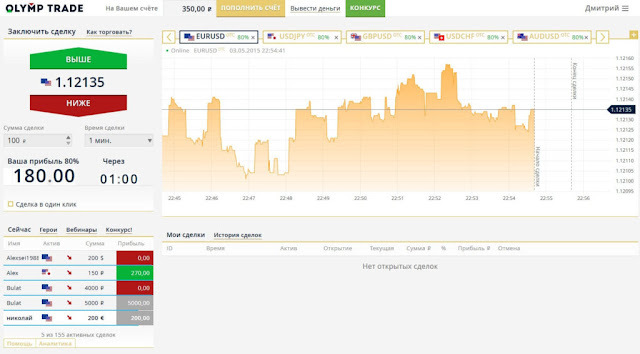 The style of the application is made with the maximum similarity to the official website of "Olymp Trade com" and contains almost all the functions offered by the web-terminal. The mobile version of Olymp Trade has small flaws. First of all, this is of course the size of the chart. Those customers who are accustomed to doing technical analysis, it will not be very convenient to use a mobile phone. For trading seconds of options, the mobile version from the official site of Olymp Trade fits poorly. This is because the reaction rate is very important here. Mobile Internet does not have a high speed, and this can lead to delays when buying an option.For this, let and a short time the price will not be in the place where the trader expected to buy the contract. Therefore, when trading binary options on a mobile or tablet, it is better to use the expiration time of at least 5 minutes. Working with the mobile terminal is very simple, in the menu on the left you can select the asset, contract amount and expiration time, and then press "UP" or "DOWN" depending on the forecast. The company Olymp Trade has one of the most ambitious training blocks, containing a lot of materials.On the home page of the broker, in the main menu you can find the sections "Training" and "Analytics", where the database of lessons and useful information on the current state of the markets is freely available. 1. "RSI"2. "Binary Gambit"3. "Japanese Standard"4. "We slip on the middle"5. "Turning"6. "Gold Rush"7. "Crossroads"8. "Law of the market"9. "Reflection"10. "MACD professional"
The presented set of indicators allows you to successfully compete with top-notch brokers. This allows you to conduct trading of binary options much more efficiently, and therefore more profitable! In order to buy a binary option, you need to select the expiration period from the drop-down menu from 1 minute to 3 hours on the tab of the corresponding asset, indicate the amount of the investment and click on the button "above" or "below". After buying the contract, below appears an additional scoreboard, which will display the progress of the transaction. From the right side, you can see a button with which you can sell the option ahead of schedule, if necessary. True, the full value of the broker does not compensate, the return from the value of the contract can not exceed 60%. As the expiration period approaches, the amount of possible return decreases. It is worth noting that in reality the terminal may already differ from that on the image. The matter is that the broker constantly updates a trading platform, constantly introducing new functions and expanding opportunities. We certainly follow the updates and try to keep up with the broker, but sometimes we can skip a few updates. Additional trading management capabilities in Olymp Trade are, first of all, the ability to hedge a deal. This function allows you to significantly reduce losses: if you see that the direction of movement of the selected asset does not coincide with your forecasts, you can complete the transaction ahead of schedule, thus fixing the amount of losses.The hedging function is available approximately 75% of the time after the transaction begins. Ie, you can cancel the deal for 5/6 of the set time. In fact, this is an element of insurance for your funds. Unfortunately, there is no such function on the demo account, so that traders can be trained with it.Another additional tools include the "Analytics" section, where you can conduct a detailed analysis of the asset using:Economic calendar; Market overview - there are published market reviews on these or other financial assets;Volatility - charts of volatility of currencies on trading sessions (Asian, European and American) are presented and trade councils are given. For users, the broker Olymp Trade provides free trading signals. To view available signals, after registering on the broker's website, go to the main menu tab: "Analytics" - "Signals". Bitcoin and other electronic currencies are rapidly gaining popularity recently - keeping pace with the progress of technology, this year Olymp Trade included the most popular crypto-currencies in the list of assets available on the platform of assets. These assets are available in pairs in relation to the US dollar (for example, BTC / USD is the value of bitcoins in dollars) and are traded in exactly the same way as traditional currency pairs.Among the currently available crypto assets, you can find Cryptoindex, an unusual tool that is an innovation on the part of Olymp: it is a composite asset, the price of which is built on the basis of the last price fluctuations of the three main crypto currencies: bitcoin, lightcoin and etherium. Every second the index can change from 0 to 3 points up or down, depending on the total movement of the mentioned currencies. Thus, cryptoindex provides an opportunity to profit from fluctuations in the general mood of investors in crypto assets - similar to how indices allow you to invest in the total change of shares. Broker Olymp Trade is a certified member of the international organization Financial Commission. It guarantees the protection of the interests of traders around the world. The amount of compensation in the event of a positive resolution of the dispute is up to $ 20,000. On the broker's website there is an instruction on how to correctly write an appeal to the regulatory bodies. The safety of investments of customers on the trading platform of the broker Olymp Trade is provided by the CROFR regulator, the license of which the company has to its credit.In addition, since February 22, 2016, the activities of Smartex International Ltd, the operator of the Olymp Trade brand, are regulated by the International Finance Commission. Regulatory oversight guarantees the integrity of the broker's actions, and also provides settlement of disputes and insurance of customer deposits up to $ 20,000 in the event of problems with the brokerage company. Exclusively, the membership of the broker in the compensation fund allows the client to obtain additional insurance of his capital from bankruptcy of the company and various illegal actions in the market.In case of disputes, Olymp Trade recommends that you contact the broker's support service in advance - if the problem is not resolved in this way within 14 days, the client has the right to apply to the above-mentioned regulatory body.An application to the International Financial Commission can be left on the official website using the online form or by filling in a pdf-document. In 206, the broker Olymp Trade won a new top in the industry. He won the nomination "The fastest growing broker in 2016" in the category of binary options under the version of ShowFX World. 1. 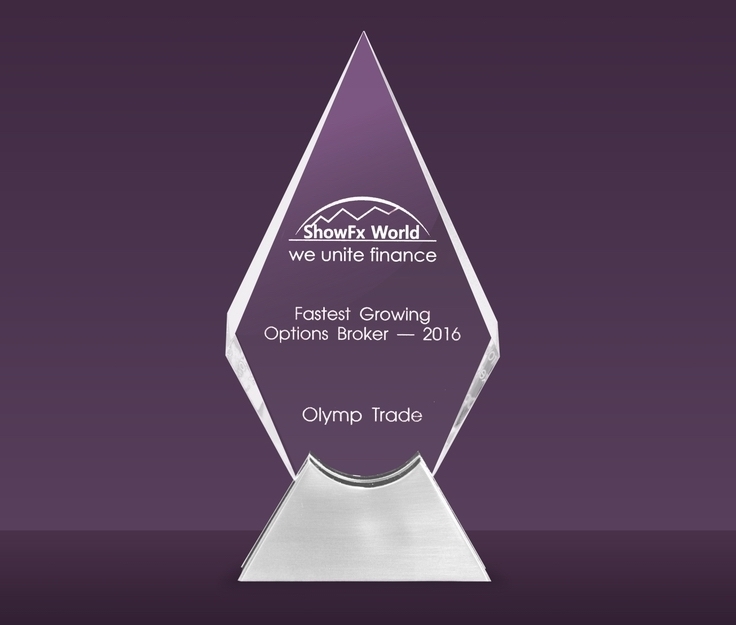 Olymp Trade has received four awards in the past two years. 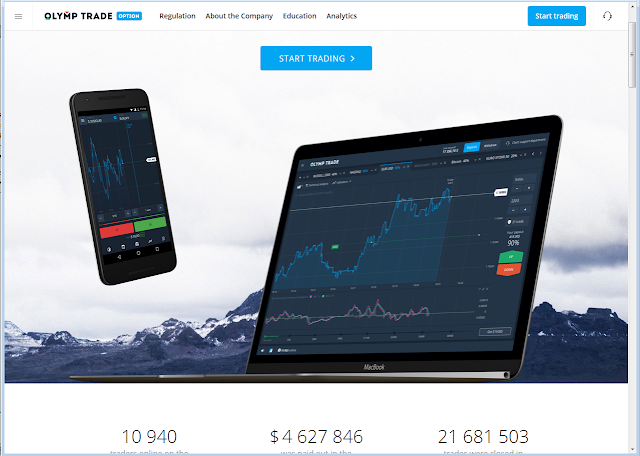 Last year, the broker was awarded the IAIR AWARDS award, which is confirmed by an extremely high level of brokerage services, as well as a high level of transaction security and convenience of the trading platform. 2. As noted by representatives of the KROUFR Awards, Olymp Trade was also a company that offers its traders the best conditions for trading. 3. In the spring of this was awarded a high award from the CPA Life Awards affiliate program from Olymp Trade. Today, the partner from this broker is among the most global and profitable programs in Russia and the Asian region and has more than 20 thousand customers around the world. 4. Financial experts from the company ShowFX World noted a number of significant innovations on the platform, including the expansion of trading platform functionality and the receipt of a special certificate FinaCom PLC, which confirms the high quality of the company's services. The support service of the company Olymp Trade quickly and qualitatively responds to requests. Customer support service supports a variety of forms of communication - chat on the site, e-mail, phone. Be sure - you will be sure to answer and solve any problem!OlympTrade provides technical support around the clock with an online chat on the company's website. In addition, you can write to the email address - help@olymptrade.com, or call. Any information can also be obtained on the official pages of most social networks. The general impression of the Olymp Trade broker is exactly the company with which it is worth starting work for beginners! Just for them there are minimum requirements for entering the market and conducting trade, one of the best and functional trading terminals on the market, a lot of indicators that allow you to put into operation your own strategy, demo accounts, excellent technical support, etc.In general, the broker OlympTrade has prepared an excellent basis for the successful mastery of the art of commerce; the level of platform quality and customer support correspond to the status of one of the leaders in the binary options trading market.The broker Olymp Trade is a worthy partner for traders, but it's worth taking into account the peculiarities of the user agreement and being extremely careful. In general, this applies not only to this broker, but to all brokers of binary options.